You're fit. Your certified. You can crush a walnut in the crook of your elbow. You're a personal trainer and you're ready to work. Better still, your field will grow by 13% by 2022. You could tattoo your fitness resume on your sculpted left glute and get the job. Not so fast. Unless you're Ronda Rousey, getting a good personal trainer job takes work. You know, a job with flexible hours and full medical and dental. For that job, you'll need a resume with the power of Arnold and the grace of Peggy Fleming. A personal trainer resume example better than 9 out of 10 other resumes. How to write a personal trainer resume that lands more interviews. Tips and examples of how to put skills and achievements on a personal training resume. How to describe your experience on a resume for a personal trainer to get any job you want. Here's a sample resume for a personal trainer made using our resume builder. Personal Trainer Resume Example - See 20+ resume templates and create your resume here. What's the Best Format for a Personal Trainer Resume? You've got the skills. You've got the certifications. You're so good you could turn Chief Wiggum into Michael Phelps. The bad news? The gym owner just zapped your personal trainer resume. Why? She didn't read it. It was too jumbled, with too many words. It looked like the "before" photo in a weight loss ad. Pick a well-respected resume format like the reverse-chronological layout. It puts your best muscle up front. Use clear, simple fonts, big headings, and white space to give the eyes some recovery time. Finally, save it as a PDF. Personal trainer resume PDFs look beautiful on any machine. MS Word resumes can go to fat the minute they get emailed. Pro Tip: Infrequently, job offers will reject personal training resume PDFs. Check the offer before you send your resume. Want to test drive other formats for a resume for personal trainers? See our guide: "3 Resume Formats: How to Choose the Best One [Examples]"
Meet the gym owner, Sharon. She's great to work for. She's got a profit sharing plan, free food for the staff, and even an on-site kindergarten. One thing she doesn't have? Time to read 300 personal trainer resumes. How can you stand out and show her your impressive skills? Get her attention like Kayla Itsines, with a resume summary or a resume objective. A resume summary is an overview of your personal trainer experience. Use it if you've got weight-rooms-full. A resume objective works without experience. It highlights drive and focus. Let's look at those one at a time. 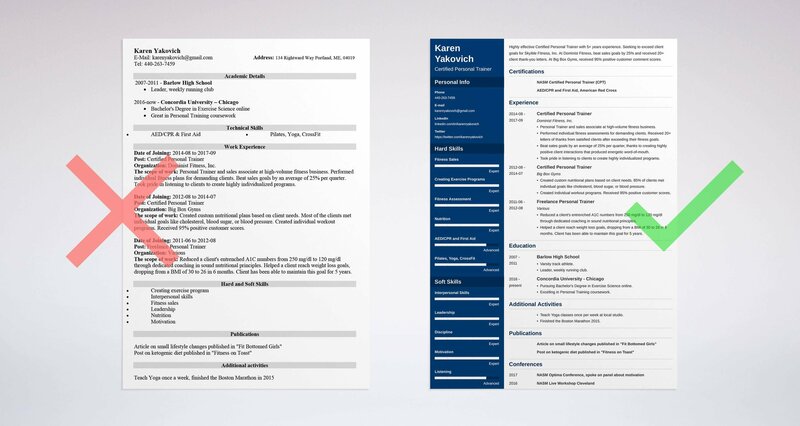 Spot the difference in these two personal trainer resume samples. CPT skilled in sales, assessments, creating exercise programs, motivation, and leadership. Seeking a position as a fitness professional with a high volume business. That personal trainer resume summary isn't exactly in couch potato land, but it won't win any marathons, either. Highly effective Certified Personal Trainer with 5+ years experience. Seeking to exceed client goals for Skyible Fitness. At Dominist Fitness, beat sales goals by 25% and received 20+ client thank-you letters. At Big Box Gyms, received 95% positive customer comment scores. Wow, who unleashed Conor McGregor on that resume, right? But all it took was some measurable achievements. Is your experience the resume equivalent of a 98-pound weakling? Take heart. The resume objective is here to help. The standard advice for those without experience is, "Show 'em your goal." If they know you want to be a personal trainer, they may hire you based on passion alone. Which one of these two candidates would you rather hire? Passionate Certified Personal Trainer and fitness professional seeking a position with Skyible Fitness. Skilled in helping clients reach exercise goals. No job experience yet but very enthusiastic and friendly. That's not awful, but it'll ultimately hit the wall like a marathon runner who forgot to carb-load. Enthusiastic entry-level personal trainer with freelance experience helping clients reach tough fitness goals. Helped one client reduce stubborn A1C blood sugar numbers from 250 mg/dl to 120 mg/dl. Helped another create a program to reduce body mass into a healthy range over a 6 month period. Nice. It's like a six-pack in a sea of beer bellies. The real secret? Both those fitness resume objectives were written by the same applicant. In one case, she did a little freelance work for a friend and one paid client. In the other, not so much. Pro Tip: Go short with your personal training resume objective or resume summary. It's just a hook, so save the full story for the body of your resume. Let's get back to our gym owner, Sharon. Right next to her copy of Ignite the Fire sit two piles of resumes. The first pile is full of experience that matches what she's looking for. The second has a sticky note that says, "RECYCLE." A resume that doesn't fit the job description like Prancercise pants is weak and flabby. So, read the personal trainer job description first. Highlight all the skills, duties, and qualities. Then put them in your personal training resume bullet points. These two NASM personal trainer resume samples are for a job that values sales, creating programs, listening, and client satisfaction. Personal Trainer and sales associate at high-volume fitness business. Performed individual fitness assessments for demanding clients. Received 20+ letters of thanks from satisfied clients after exceeding their fitness goals. Beat sales goals by an average of 25% per quarter, thanks to creating highly positive client interactions that produced energetic word-of-mouth. Took pride in listening to clients to create highly individualized programs. Don't blink, because with an experience section like that, you'll have the job so fast Usain Bolt would miss it. Fitness professional responsible for all personal trainer duties at a high-volume fitness firm. Worked with clients to meet nutrition goals. There's no reason not to hire that applicant, except that the other one is so much better. It's like choosing between Zach Galifianakis and Tom Brady for your local football team. Zach might be fun to hang around with, but Brady will get the job done. Is your work history like a Minecraft enthusiast? Would it have trouble picking up a cooked spaghetti noodle? If so, dig into your past to find experience you didn't know you had. Still can't find it? Volunteer, or do some freelance work. Check out these two beginner personal training resume examples. Personal Trainer Experience: No on-the-job experience yet, but I'm a fitness enthusiast and I know how to train people. That's the Arnold Horshack of experience sections. It sounds odd, and it won't pull its own weight. This next sample of a resume for a personal trainer gets it done like LeBron. Reduced a client's entrenched A1C numbers from 250 mg/dl to 120 mg/dl through dedicated coaching in sound nutritional principles. Helped a client create an exercise and nutrition program to reduce body mass to within healthy levels in a one-year period. Created a daily exercise program for a client to give her more energy and help her feel better about her daily life. That's what we call "well defined." The gym owner is reaching for the phone. But how did a fitness trainer newbie get that kind of experience for a personal training resume? She did a little volunteering and freelance work. The A1C client was her sister. She made the other fitness programs for freelance clients in a couple hours each. Pro Tip: If you love fitness, chances are you've already done some free personal training for friends and family. Add it to your entry-level fitness resume. Want more advice to bulk up your certified personal trainer resume? See our guide: "How to Put Achievements on a Resume - Complete Guide (+30 Examples)"
Education matters for a personal trainer. How you show it on your resume matters even more. Your education section has to grab the hiring manager. Otherwise it's like having a Concept 2 rower in the basement, hidden behind boxes of old shoes. That's as in-shape as Chunk from The Goonies. But add details that fit the job description, and suddenly you're Dwayne Johnson. Look at our next personal trainer resume sample. Pursuing Bachelor's Degree in Exercise Science online. Excelling in Personal Training coursework. Nailed it. With a little thought, your fitness resume can prove you fit the job description like a squat suit. We're not saying you need a degree in exercise science. The main idea is, pick your bullet points with care. But if you're going after a degree, list it on your personal training resume. It shows added promise. Pro Tip: Pick your most impressive achievements for your bullet points. If your GPA was 3.7 or higher, that qualifies, so show it. Make your personal training resume stand out like Gisele Bündchen at a KFC. See this guide: "How to Put Your Education on a Resume [Tips & Examples]"
Let's look back in on Sharon, the gym owner. There's her "You can Do It" coffee mug. There's her copy of Strong Curves. The frown on her face comes from 250 personal trainer resume skills lists as long as her set of multi-colored exercise bands. She doesn't want a million skills. Nor does she believe them when she sees them. She just wants the ones she posted in the job offer. Oh, and she wants proof. How can you provide that? Highlight all the skills in the job posting. List the ones she wants. Then prove them in your personal training resume bullet points. The skills listed in the job description are creating nutritional plans, making workout programs, and client interaction. So, you'll list those, plus a couple more. Then you'll nail your bullet points like Steph Curry hitting a 3-pointer. Created custom nutritional plans based on listening to client needs. 85% of clients met individual goals like cholesterol, blood sugar, or blood pressure. Created individual workout programs. Received 95% positive customer scores. See how those tie into the offer like a cable to a stack of weights? Wow, right? Why don't we just add "blowing up the Death Star" and "vanquishing Lord Voldemort?" The Gym owner just rolled her eyes. Need a running start? Use this personal trainer resume skills list. Then add to it from job offers online. Follow the plan above, and your personal training resume will make you look like Muhammad Ali with a Fitbit. Pro Tip: The skills you add to a resume for a personal trainer depend heavily on the type of work you will be doing. You may be able to raise the dead, but if the manager doesn't care about it, leave it off your skills list. Need to put your skills section on a strength training program? Use the certified personal trainer resume template up top as your guide. Also, see this article: "+30 Best Examples of What Skills to Put on a Resume (Proven Tips)"
How important are certifications on a personal training resume? Only as important as lungs for an aerobic workout. If you don't have at least one, you're not getting off the ground. Your certifications depend heavily on the kind of work you do, and who your clients are. Whichever certs you have, display them proudly on your personal training resume. Put the one that matters most to the hiring manager right after your name. You can also put your key cert in your job descriptions. See the personal trainer resume template up top for help with placement. Pro Tip: CPT and CPR/AED certifications are almost mandatory on a personal training resume. The CPT takes weeks or months. The CPR/AED cert takes just a few hours. Your skills and education are the only thing that matter. That's as wrong as trying to lose weight by eating funnel cake. A well-rounded employee with passions and interests is worth ten others with the "right experience." Add "other" sections to your personal training resume to show you're not just another flat stomach. Teach Yoga classes once per week at local studio. Finished the Boston Marathon 2015. Article on small lifestyle changes published in "Fit Bottomed Girls"
Post on ketogenic diet published in "Fitness on Toast"
2017 NASM Optima Conference, spoke on panel about motivation. 2016 NASM Live Workshop Cleveland. That's great, right? Like Cassey Ho in disguise. Ouch. Who wants Peter Griffin training them? Pro Tip: Do you find yourself listing a bunch of skills you don't have, just to fit in? If so, try a job offer that fits your skills better. You'll be happier when you get it. Need more suggestions to give some extra protein to your professional personal trainer resume? See this guide: "+20 Best Examples of Hobbies & Interests To Put on a Resume (5 Tips)"
"Nobody will read your personal trainer cover letter." That's the worst excuse since, "the cat ate my gymsuit." About 40% of hiring managers still consider cover letters mandatory. So, get off the couch and write one. Make it personal by calling the manager by name. Make it passionate by mentioning a fact or two you like about the company. Show how you can help with a glimpse of your achievements that fits the company's big challenges. It's been my dream to work at Skyible Fitness for years. Your company's philosophy of listening to the client first makes all the difference in the world. I think my proven listening skills and 95% positive client review scores will help make me a valuable member of your team. That's it! End with a call to action. That can be as simple as, "I'd love the opportunity to talk more with you about your goals." Pro Tip: Don't be afraid to follow up. A personal trainer cover letter without a nudge a week later can slip from the manager's memory. To write a solid cover letter for your personal trainer resume, see this guide: "How To Write A Cover Letter [Complete Guide With Examples]"
Contact info's not as easy as you think. "Professional" means no SuperBobTheBeerDrinkingFool997823@yahoo.com. Nobody wants him toning up their abs. Don't add your snail mail address unless the hiring manager asked for it. Do add your LinkedIn profile. That'll let the manager see this fledgeling Jillian Michaels in her natural element. Pro Tip: Don't let an electronic skeleton in your digital closet cheat you out of your dream job. See our guide to cleaning up your online presence here. Need more advice to build the best personal trainer resume you can? See our guide: "How to Make a Resume: A Step-by-Step Guide (+30 Examples)"
Start with the job offer. Highlight all the skills and responsibilities you see. Then prove you've got them in your personal training resume. Put a carefully crafted personal trainer resume summary or objective at the top. In the experience and education sections of your resume, add bullet points that fit the personal trainer job description like a spray-on tan. Add "other" sections that show depth and passion. That way your fitness resume is more than just a sheet of paper. Do you have questions on how to write a great resume for a personal trainer? Not sure how to describe your skills or achievements? Give us a shout in the comments! We love to help!